Decca Tweeted about Clay’s new album. When was the last time you heard a positive comment about Clay from his record label? The list is on video at the site. Actual Outcome: Oh, ye of little faith. Thankfully for Clay, the mass market can sometimes see greatness beneath the surface. While he may have come in second (by a mere 130,000 votes), Clay went on to debut at #1 on the Billboard chart with the highest-selling first album by an Idol alum to date. He has scored a number of subsequent hits (though he left the RCA label in 2008), generated some $28 million at the concert box office in his first five tours, and starred on Broadway in Spamalot. TV Guide : American Idol…Where Are They Now? I wonder if Clay Aiken will be asked to help with this tragedy. The U.S. Fund for UNICEF is urgently appealing for emergency assistance to aid the victims of a devastating earthquake that rocked the Caribbean nation of Haiti early today. The earthquake that hit Haiti today is believed to have caused significant damage to the capital, including damage to UNICEF’s own office. The 7.0 magnitude earthquake was centered west of Port-au-Prince, less than 15km from the UNICEF office. Dennis McKinlay is the Executive Director of UNICEF NZ. He stated that communications with Haiti are extremely difficult at the moment and phones that are functioning are being used for the emergency response. “We have very little information at the moment, but early reports are that the population has sustained significant damage, including damage to our own office. We don’t know the extent of damage or injuries, but expect to have more details by tomorrow. “In the meantime, UNICEF is working both locally and internationally to respond to the humanitarian needs that may arise from the earthquake, such as lack of clean water and sanitation, and the spread of diseases. UNICEF’s country office in Haiti and the regional office located in Panama have already deployed emergency teams to assess the situation and determine what the emergency needs are for the people of Haiti. They already know they need funds to help provide safe water, temporary shelter, and essential medical supplies. According to UNICEF’s website, Haiti is the poorest country in the western hemisphere and has a population of 9.6 million inhabitants, of which more than half are under 21 years old. UNICEF has been working in Haiti since 1949 and works directly with Haiti’s government on developing long term solutions to current problems caused by poverty and lack of basic health care, education and sanitation services. To donate to the ongoing emergency relief efforts in Haiti and the Caribbean region, please visit: www.unicefusa.org/haitiquake or call 1-800-4UNICEF. That is very sad about Haiti. It sounds like there will be lots of casualties. My ongoing prayers go out to the people of Haiti. Thank God for organizations like UNICEF that will do everything they can to help. Yesterday was a great, positive news day for Clay. There is so much excitement, especially after the Decca tweet. Bring on that new CD! My prayers are also with the people of Haiti. What a horrible disaster. Very excited about that tweet. Sounds like it really won't be long now for the cd, and it should be good (as if there was a question). Yea!!! On a lighter note, it sure was exciting yesterday after the Decca tweet. It sounds like the CD is close to being complete….Wonderful..can't wait for the promotion and seeing Clay again on shows, etc. We have missed him greatly. Awful news about the earthquake in Haiti. All my prayers are forwarded to them. I have been reading about the situation and watching it on TV. Too bad this had to happen. Also, so excited about the tweet yesterday about Clay's CD. Cannot wait for what is to come. I have really missed him. We have had a fantastic Clay Aiken week! Loved the Decca Tweet yesterday and Clay's Tweet about helping Unicef in Hati. 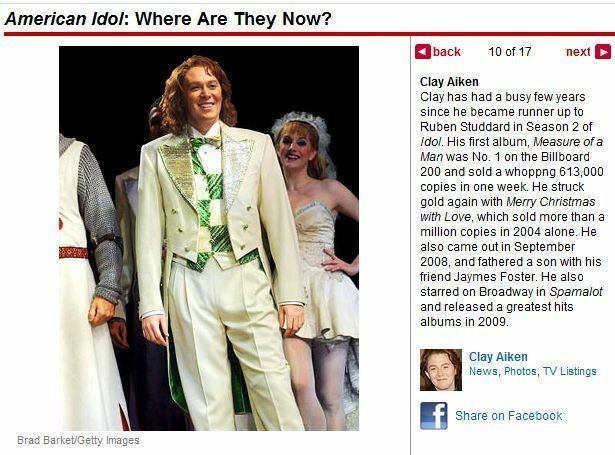 Yesterday was a great day for Clay Aiken fans and we are hoping this will be a yearto remember. Very wise to mention on this blog something near and dear to Clay, Unicef. They will be using all their resources now in Haiti. Error: Error validating access token: Session has expired on Tuesday, 21-Aug-18 16:13:01 PDT. The current time is Wednesday, 24-Apr-19 21:17:37 PDT.